The highest quantities of food are brought to the nest once the nestlings are 40 days old. Ozzie is bringing up to 6 fish to the nest per day. 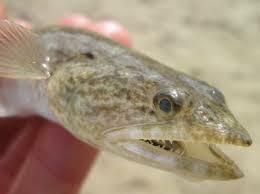 The first fish this morning is a lizard fish. Look how David and Jesse aggressively go for the catch. They do not need to be fed anymore. David and Jesse can rip and tear flesh with their sharp hooked beaks as well as any osprey their age. “Taste like pin fish,” said David. “Taste more like mud toad to me,” replied Jesse. The Doctor does not like The Lizard fish. He does not like the lizard fish at all. We’re not talking about cuisine. We are talking about aesthetics. 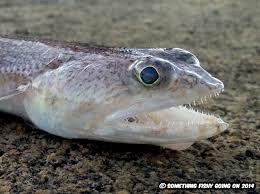 The lizard fish is one ugly fish. 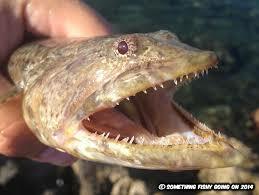 They are ferocious predators with needle-like teeth. 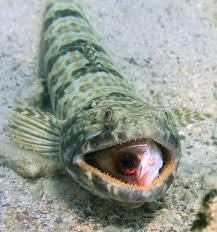 When caught by rod and reel, they always completely swallow the bate and/or lure. If you want your lure or hook back you must go digging with your fishing knife. The horrible little creature will snap and bite at you even after you think it is dead.